President of the Republic of Azerbaijan Ilham Aliyev and Prime Minister of the Slovak Republic Peter Pellegrini have held a one-on-one meeting. 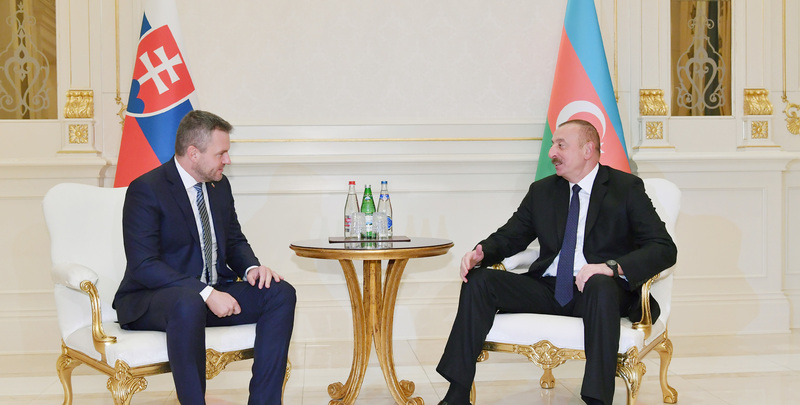 President Ilham Aliyev welcomed Prime Minister Peter Pellegrini. The head of state congratulated Peter Pellegrini on his appointment as the Prime Minister of Slovakia. President Ilham Aliyev hailed the fact that Peter Pellegrini is paying his first visit to Azerbaijan as the Prime Minister and that this trip is taking place shortly after his appointment to this high office. The head of state noted that Peter Pellegrini`s visit to Azerbaijan creates favorable opportunity for developing bilateral relations. President Ilham Aliyev said that Azerbaijan-Slovakia ties are also important in terms of developing Azerbaijan`s cooperation with the European Union. The head of state described the signing of the “Partnership Priorities” document between Azerbaijan and the European Union in Brussels this July as a sign of the EU`s attaching importance to relations with Azerbaijan. Prime Minister of the Slovak Republic Peter Pellegrini thanked for the warm words and high hospitality shown to him. Peter Pellegrini said he is pleased to pay his first visit to Azerbaijan as the Prime Minister, adding he previously visited the country as the parliament speaker during the European Games. He said this prestigious international event was excellently organized. Touching upon bilateral relations between the two countries, Prime Minister Peter Pellegrini stressed the significance of an Azerbaijan-Slovakia business forum held in Baku as part of his visit, and noted that it will contribute to the expansion of the economic cooperation.